For a long time, I nourished a latent fascination with a peculiar type of vernacular house. 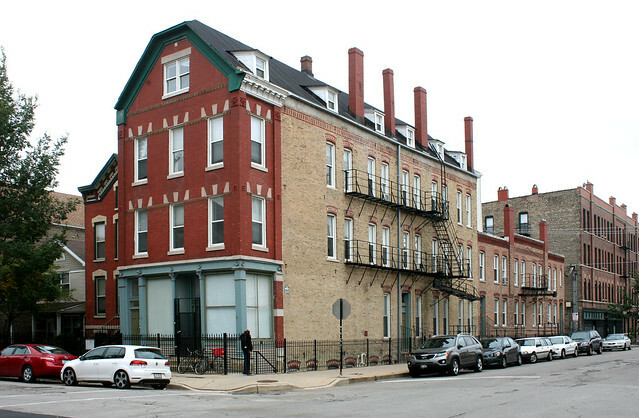 Often gabled, sometimes flat-roofed, these houses are sized to fit the standard 25′ wide Chicago lot. They are typically two to four stories tall. But they are incredibly long, extruded all out of proportion and stretching on for bay after bay after bay. Their rooflines may have up to half a dozen chimneys, lined up like soldiers on the march. One or more entryways are often found on the long side, providing separate access to apartments further back in the building. Most are flecked with many windows. 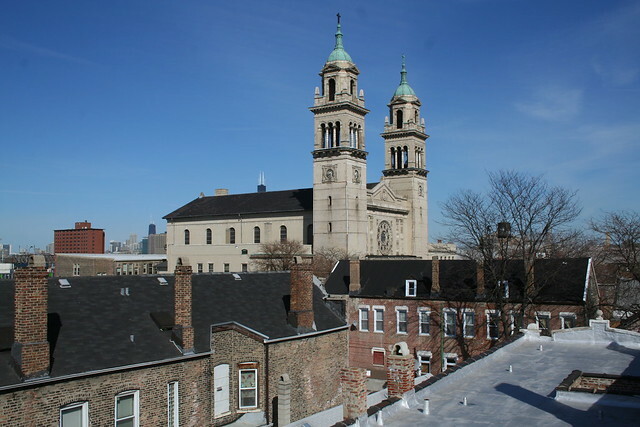 Long houses of Pilsen, seen from the Pink Line El, with St. Adalbert Church beyond. Once I began looking more closely, a few things jumped out. Firstly, these houses are usually on the end of their block. The long side faces a street or alley. The reason for these abnormal houses, then, suggests itself: With the sure knowledge that no future neighbor would block up the light and the view, there was no reason not to fill the entire length of the lot with building. For an owner, it meant more space and more rental income. 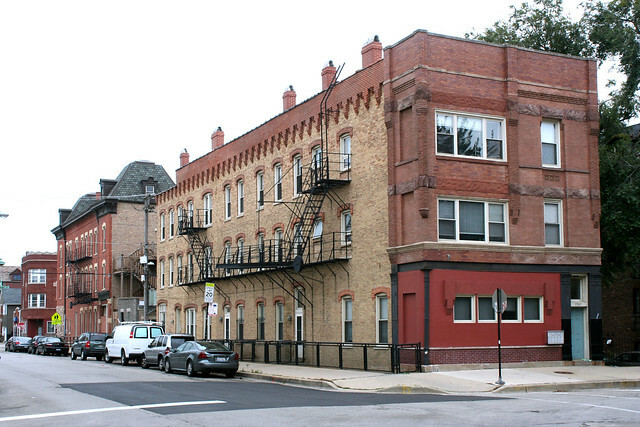 Buildings on this model proliferated in two neighborhoods: Pilsen, and Pulaski Park. 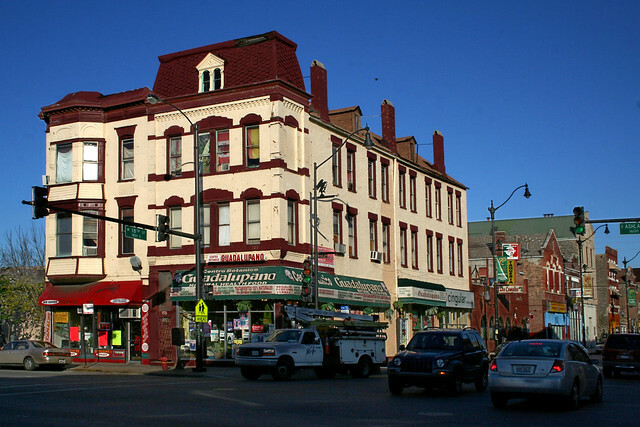 Both have a common point of origin as home to Polish immigrants in the late 1800s. 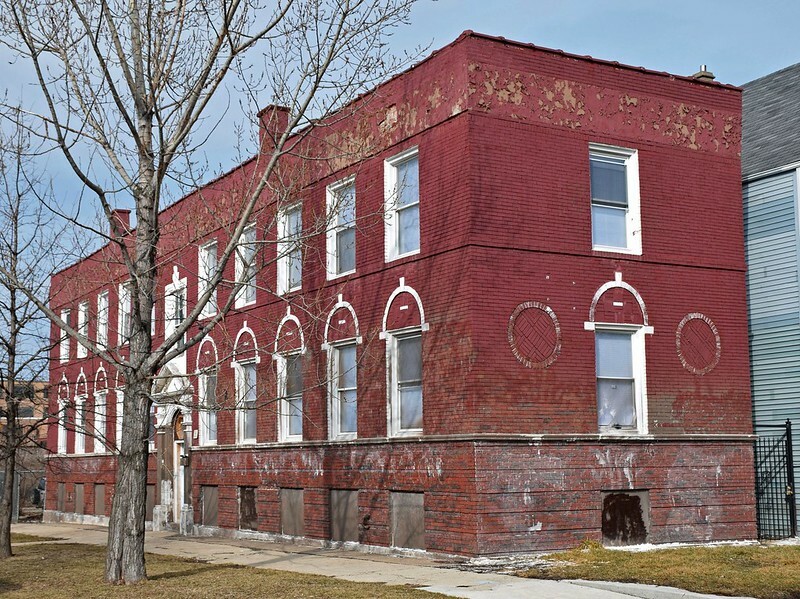 In Milwaukee, Polish immigrants famously developed the “Polish Flat” – a wood-frame house that, as time and finances allowed, would be jacked up a level, with a more solid brick basement built underneath. Likewise, back-lot houses would be added behind the main house to provide rental income – or a smaller front-of-lot house would be moved to the rear when a more spacious replacement could be built. In short, Poles were experts at extracting value from precious city land, and these houses are designed in the same tradition. 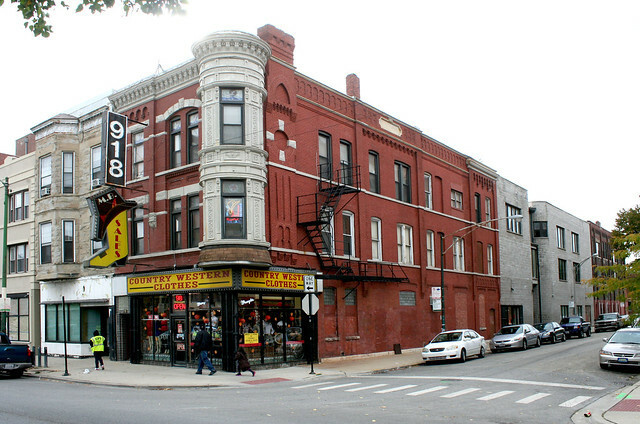 The archetypal examples, in my mind, stand in the Pulaski Park area, clustered along Blackhawk Avenue, just east of Ashland. 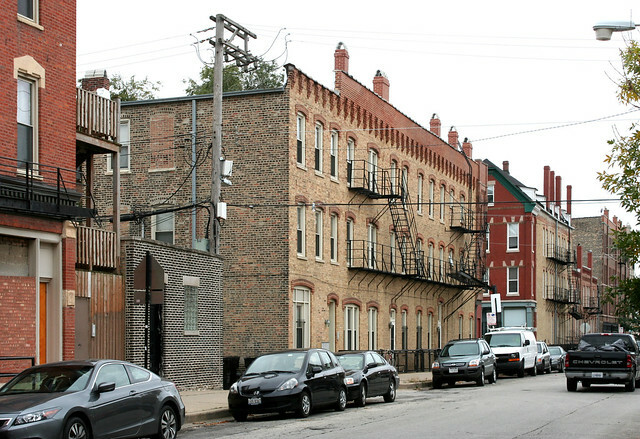 1409 N. Greenview Avenue, at the mid-block alley. This house suffered a serious fire in 2004 that destroyed the third floor, attic and much of the roof; it has, obviously, been restored since then. A number of things make these houses curiosities to me. First is the steadfast refusal to treat the exposed long side of the house as decorated architectural facade. The same unadorned common brick that would appear on an unexposed wall (ie, one crowded up against a neighboring building) is used in most cases; on the building above, a simple gabled roof is extruded out of the elaborate front bay. The front is the front and the side is the side, and that’s that. That elaborate façade is another point of interest – they came in all styles, arrayed with beautiful brick corbelling, pressed tin cornices and finials, cast iron storefront columns, carved stone lintels and more. 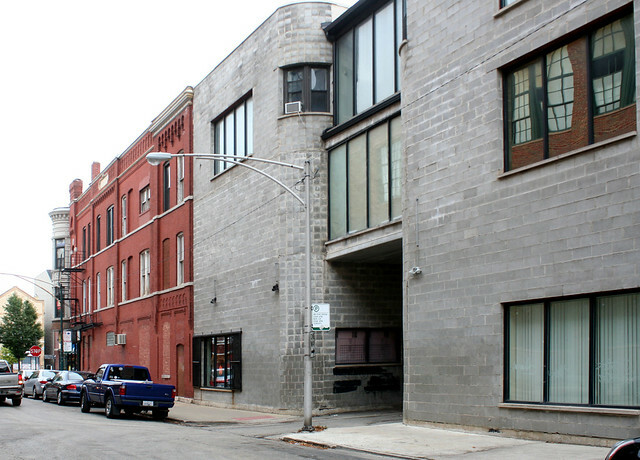 918 N. Ashland Avenue at Walton – a particularly curious case, as a modern addition has continued the fill-the-whole-block approach begun by the original building, while conjoining it with the building across the alley. And then there is the final mystery – what kind of floor plans were originally hidden behind those walls? Are the interiors contiguous or separate? How did a preponderance of light and air on one side affect the design? Maybe one day I’ll turn up some plans, but till then I simply gaze and speculate. 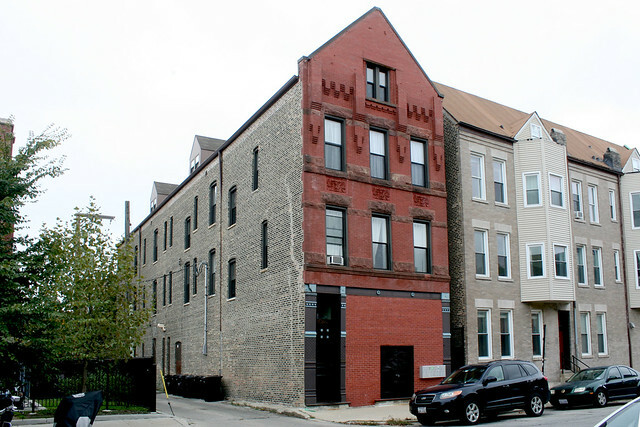 This entry was posted in building types, Chicago neighborhoods, Pilsen / Little Village, Vernacular architecture. Bookmark the permalink. I remember reading somewhere that the Bohemian Czechs were the main ethnic group in Pilsen and that they attended different churches than their Polish neighbors, because of disagreements with the Catholic church’s politics going on in their homeland when they immigrated. Can’t tell you how much I love this blog. 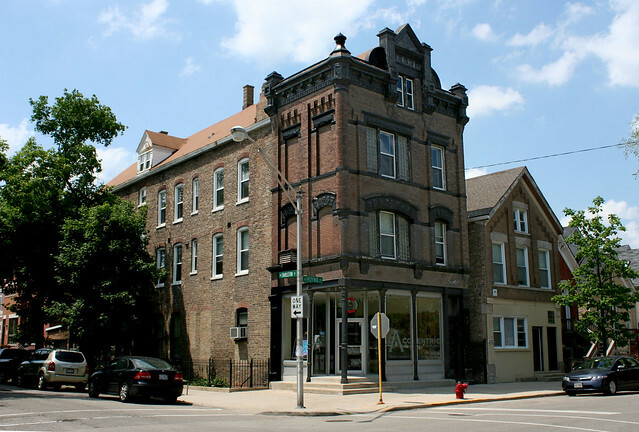 I was wondering if you’ve every profiled the boulevards between Bronzeville and Hyde Park(Drexel, King, and Hyde Park) There are miles of extraordinary buildings! Would love to see your take on them. I didn’t know this area was still so intact. I thought it had been McMansionized like much of Lincoln Park and some of West town. 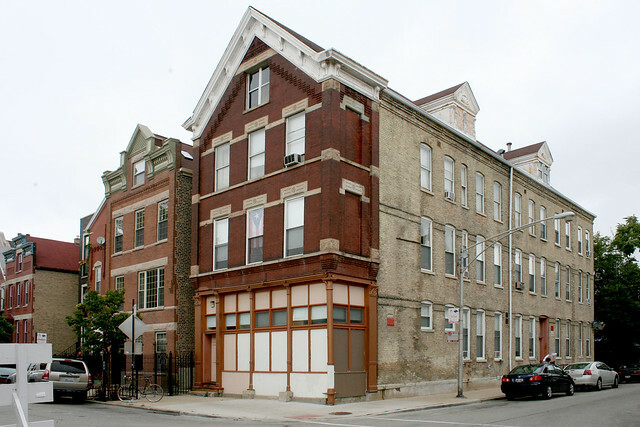 Due to the unique Chicago building code our vernacular buildings are actually legally several buildings. With this particular type it is quite obvious. What you’re looking at is a side door on the front and two to three side doors on the side of the building. These lead to what are essentially separately fire walled three flats with a lobby area between them where the staircase allows access to each. All of this is surrounded by one building envelope. But the key is that legally, as far as the building code is concerned, this is two, three, or even four adjacent buildings. That why Chicago storefronts are almost exclusively the standard 25 feet across. There’s a fire wall between every one of them. And so it is with the apartments above, so it’s very common to see storefront-storefront-door to apt- storefront-storefront-door to apt, etc. 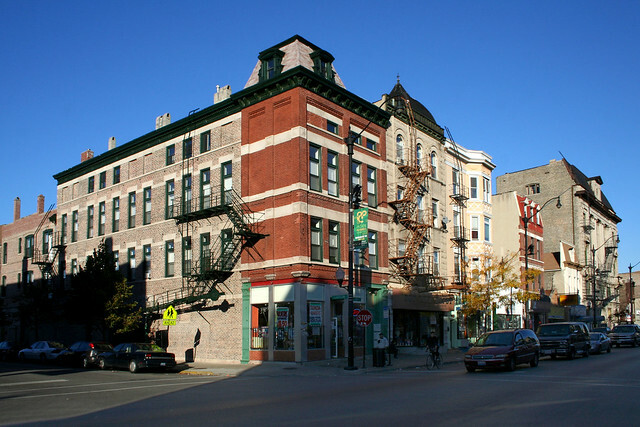 Buildings that did not follow this rule had to meet a higher standard of fire resistance, so it is rare to see corridor apartment buildings in the citys vernacular (though they do occasionally exist) unless it’s in a highrise and already had to meet the more stringent code. This is notable particularly because it really is unique to Chicago. Los Angeles, for example, is filled with prewar corridor apartment buildings. Anyway, this is also found in Bridgeport. There are several of these in the blocks West of Morgan. It’s also found in the Noble Square area. 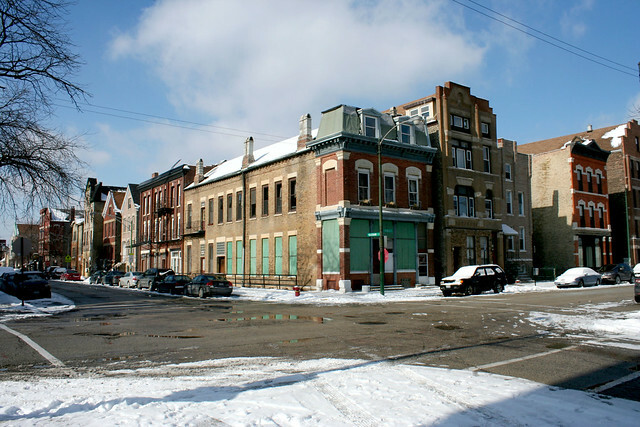 It’s almost surely true that it was also common in the lost neighborhoods of ‘Little Hell’ (Cabrini Green displaced it), Maxwell St, and the formerly Dutch ‘The Valley’ area West of Ashland and South of Roosevelt that the medical district eminent domained. I’m referring to those massive vacant lots that are sprouting Costcos and FBI centers. The only reason it seems so localized now is because so many of the oldest immigrant neighborhoods have been planned out of existence. @ Cody – thanks for an awesome dose of info! I will have to poke around some of those areas next time I’m in town. I am surprised to hear that they are fire separated inside. Normally that requires a brick parapet – easy to do with a flat roof, but not in evidence on the gabled buildings. It makes sense, though. Irina – I’d call that one a different beast. While it looks like it fills most of the lot, it has a fully finished facade on both exposed faces, and it’s oriented towards the long face. It looks like four (six? eight?) apartments around a central stairwell, rather than a series of separate spaces back-to-back. It lacks the sort of ad-hoc quality of the long houses.